Ruby and Python have been around for a long time almost as long as Java and PHP hang on a second, Python is older than java. Both PHP and Java are decidely on the decline and according to the fan boys both Ruby and Python are on the ascendancy. But that's not exactly consistent with what Google Trends says. 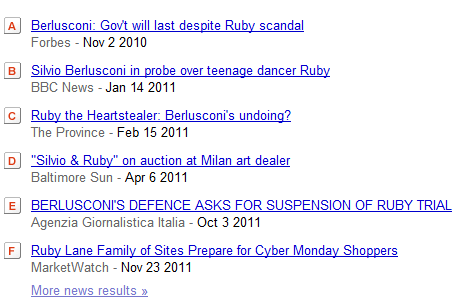 They will however point out that Ruby has had a few spikes since late 2010. But the real reason for those spikes have nothing what so ever to do with the Ruby language. Both these languages are widely used for web app development. But to do so, there is a steep steep learning curve you need to climb. Though I managed to learn Ruby in less than 48 hours I didn't have quite the same sucess with Ruby on Rails. It's installation is a nightmare and backward compatibility is almost non existent. So much so that there is even a Ruby Version Manager that allows you to have multiple versions of RoR installed on the same computer. It's not the backward compatibility of the Ruby language that's at issue here but of the Ruby on Rails framework. So in short learning and coding in Ruby is one thing but doing the same with RoR is an entirely different ball game. Python is perhaps worse. Even though Python 3.0 was released in December 2008 python 2.7 is still heavily downloaded and some linux distros still ship with python 2.6x. Why? There is lots of code written with python 2.7 and there are backward compatibility issues in python 3.0 that breaks them. The fan boys will say those issue are minor and insignificant. Ask them to explain why Google App Engine still supports version 2.5. Why is 2.7 (never mind 2.5) still in existence and why were some changes from 3.0 and 3.1 back ported to 2.7?